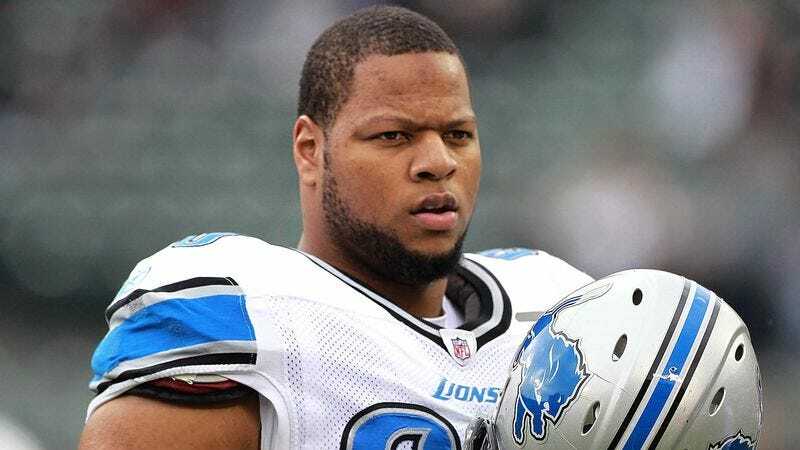 DETROIT—Calling the recent realization alarming and something he is not at all comfortable with, Detroit Lions rookie defensive end Larry Webster III expressed his growing concern Friday that teammate Ndamukong Suh has decided to take him under his wing. “Ndamukong often pulls me aside to give me pointers on improving my pass rush, and the other day it dawned on me that he might actually view himself as a role model for me, which is a pretty terrifying thought,” said a visibly shaken Webster, adding that he first suspected the three-time Pro Bowler had a special interest in him after Suh began offering advice on how to conduct oneself as an NFL player both on and off the field. “Maybe he wants to pass on his knowledge and experience because he sees a little of himself in me—that’s the sort of stuff that keeps me up at night.” Webster went on to say he is increasingly worried that Suh’s rumored offseason move to the Jets or Giants will fall through, ensuring that the veteran defensive tackle will continue offering guidance and support to young Lions players for years to come.